Ben, one of 71st Reading Cubs looking at Water hyacinth. 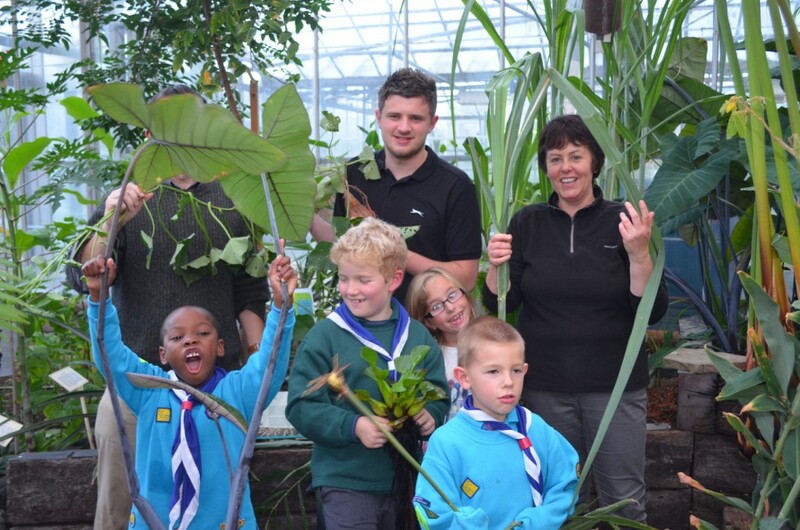 Monday afternoon was grey, cold and wet but the Reading 71st Beavers and their helpers braved the weather to walk to our tropical glasshouse. 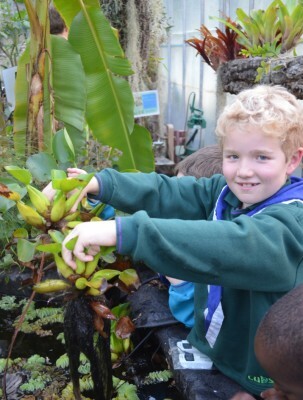 Thick coats were soon shed and the children had a chance to look around and interact with the tropical plants. The group arrived just after 5pm to make use of the remaining daylight and luckily their walk across campus coincided with a break in the heavy rain. The keen band of children were ready to explore the tropical ‘jungle’ and discover more about the fascinating world of plants. One of our rice plants in seed. 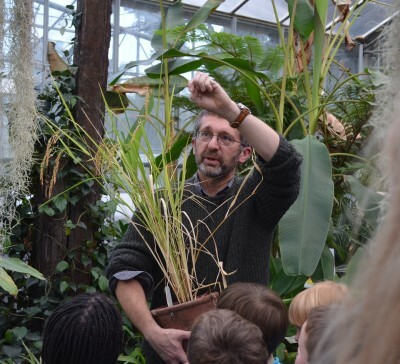 As a group we looked at some crop plants: – Rice, banana, pineapple, sweet potato and sugar. Rice grains are tiny and wrapped in a tough husk which we managed to rub off using finger nails. It would be a lot of work to manually clean enough rice for a meal. Weeds including our floating plants were the cause of much interest as always with childrens’ visits. We also looked at some of the carnivorous plants (and smelled the contents of a Nepenthes pitcher (not good!). The sensitive plant, Mimosa pudica, also caused much delight. The beavers gave a vote of thanks to the University staff for helping with the visit and we would like to thank the beaver group leaders Kate Ferguson and Kenny McMillan for bringing their group along and keeping them under good management throughout the visit. This entry was posted in Hands-on, Learning and Teaching, Public. Bookmark the permalink.